Quite A Box Of Tricks is a plug-in for Adobe’s Acrobat from Quite Software, for Macintosh (including Mac OS X) and Windows. It is compatible with Acrobat versions 7 through to the very latest. Quite A Box Of Tricks is a plug-in for Adobe’s Acrobat from Quite Software. The aim of Quite A Box Of Tricks is to make easy commonly needed PDF functions that were difficult, time consuming, expensive, or just impossible. The functions come under five heading: shrink, colour, transform, fields, and info. The plug-in is extremely easy to use, but also comes with a 48 page online guide to give extra insight into PDF and get the most out of the plug-in. XML is rapidly gaining acceptance as a way of transferring information between programs, so it was a natural choice for us in describing imposition tasks. So we will encourage OEMs, integrators and workflow vendors to create customized workflows using its Hot folder or Command-Line (XML) tools. If you are using Quite Imposing Plus, it makes an XML for every imposition you create, so you already have XML available for Quite Hot Imposing. 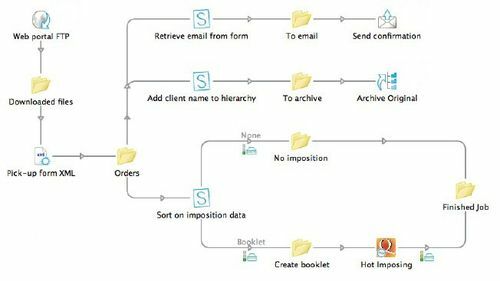 There is direct support for integrating Quite Hot Imposing with the Switch range of workflow automation products from Enfocus as per the example below. The XML metadata is used to determine how a file should be imposed. You create the imposition layout, then export the settings for use with the Quite Hot Imposing configurator in Switch. Leave nothing to chance when Imposing. Quite Imposing and Quite Imposing Plus are plug-ins for Acrobat XI (11.0) back to 7.0 to perform imposition. The man in our logo on the right is doing imposing as it used to be done - manually. This was a craftsmans task which required much expertise and skill behind it. Our modern imposition tools perform at the same level of skill and are quick to learn and easy to use. 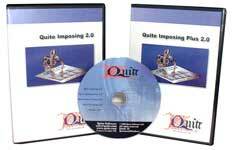 They give immediate results without need for expensive training or complicated job set ups. But if you do need a little help getting started just visit our support pages to see the variety of ways to get technical help. Quite Revealing is a plug-in for Adobe’s Acrobat from Quite Software, for Macintosh (including Mac OS X) and Windows, qorking with Acrobat 7 through 11 ("XI"). Extremely easy to use, Quite Revealing is designed for pre-press professionals, and those producing files for press use (much as we hate to admit it, if you don't work in design for press, or pre-press, or don't know what pre-press is, this plug-in probably won't help you). 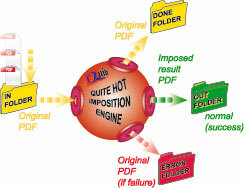 It aims to show information that is otherwise difficult to find about a PDF document. Information like the plates used, exactly where fonts are used, transparency, overprinting and more. This information is often difficult to find when your preflight tools have produced a report that tells you what is wrong with the file but not where. That's where Quite Revealing comes in. But Quite Revealing goes further than that. It can also fix some of the more awkward problems that can arise - like differently named spot plates, unwelcome transfer functions, or ICC profiles that don't belong. Quite Suites We bring you 2 new ways to buy your much needed Quite products.